These days, when people ask me what I do, I stumble through an answer. “Well… right now I homeschool my kids… and for the past five years I’ve been working intensely on learning naturalist skills… and I’m involved in community-building and mentoring… and sometimes organizing events… and I write a lot… although, you know, mostly a blog. And I feel very busy, all of the time.” It never comes out smoothly. I reported these two conversations to a third friend, who asked “Well, how DO you identify yourself?” I couldn’t come up with a satisfactory answer. Another young friend once said that he never found career counseling useful because it was always trying to narrow him down, and he felt that becoming an adult was an ongoing processed of broadening, of expansion. I admired his maturity in recognizing that, so many years before I did. When I was working on my Master’s in Education, seven or so years ago, I wrote a paper that was initially about my learning, but became in many ways about my identity in the world. Recently I thought back to it, and it helped me to realize that what I have now – what is emerging now – is what I asked for then. And to see that uncertainty and self-doubt are the flip side of having the freedom to step back and re-design these parts of my life. The paper was for a course on adult learning, which was different from any course I had taken before, and possibly the academic course that has had the deepest influence on me, in my own life and in my vision for educating my kids. We started the course diving into sensory experiences. For the first month, we were asked to conduct an “inquiry” or experiment each week, journal on it, and share our reflections with the class: literary inquiry, musical/sound inquiry, performance/movement inquiry, and visual art inquiry. The goal was to experiment with whatever each of these themes meant to us. Out of this, we committed to choosing an area of inquiry, learning something new – anything – and documenting that learning. And only after we had reflected on our own processes and started working on our own project, did we layer in readings on adult learning theory, much of which is about learning through life events, relationship, community, and personal transformation. I decided to pursue a visual art project, and after considering art classes of various kinds (oh, the joy! 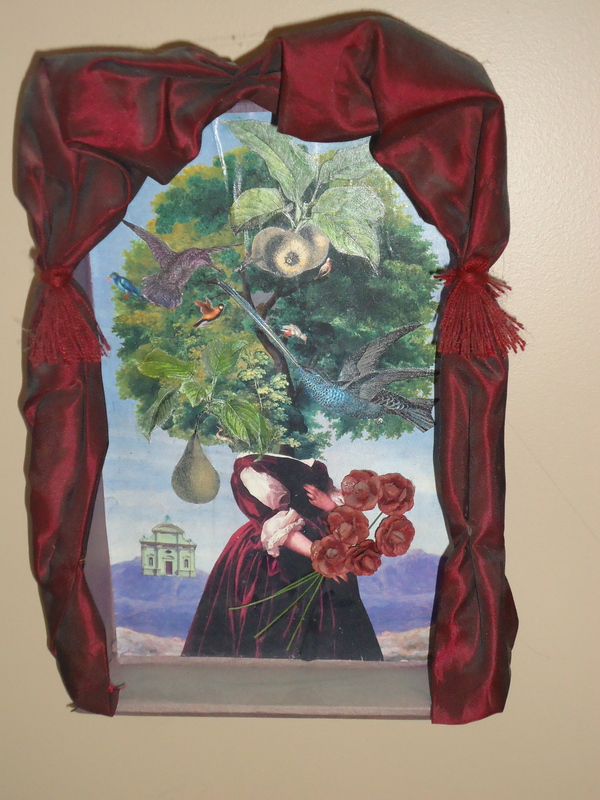 ), I came upon a weekend workshop on creating shadow boxes or “mixed media assemblages”, which are something like three-dimensional collages framed inside a small shallow box, often using found objects and images. My first small shadow-box I completed that weekend; I started a second; and as I completed that one and also created a third, I realized that my three pieces could be put together to represent stages in my learning cycle. I decided one stage was missing and created one more piece. Together these little pieces spoke to my experiences of inspiration, influence, community, reflection, introspection, transformation. I might change some of the parts now; in fact, I would add even more of them. But assembling them all together in the same frame is what this picture is about. Can I break it down into percentages? Can I give each identity its own day of the week? Take on a different one each month? No. Life does not work that way at all. These parts have meaning in relation to each other; together they form a picture of my life. The picture is being assembled, being created, emerging. It helps me to remember that, whatever our primary occupation(s), we can resist these pressures to narrow ourselves; we can embrace constant learning, multiplicity, and expansion. We can continue to assemble and reassemble all the pieces of ourselves together to create our own particular works of art. I suspect that I am underusing this blog. From posting once a week when I started last summer, I’m down to posting once a month. I wait for inspiration; I get through the rest of my to-do list first; I edit things slowly. It takes me up to a week of loitering to post anything after I’ve written it. The process seems full of obstacles, real and imaginary. 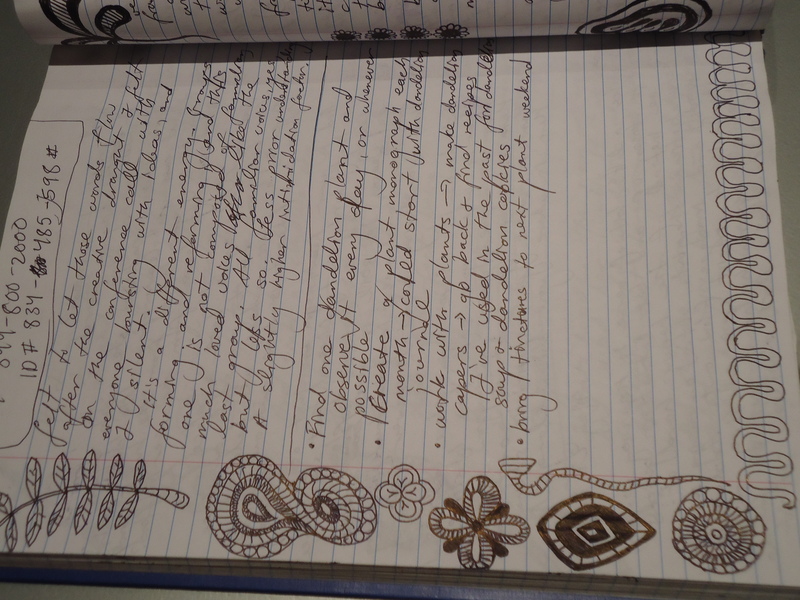 And in the meantime – in my real, everyday life – I write copious amounts in my notebook/journal every week. I love writing for myself – it’s like speaking to a dear friend. Unconditional listening with no judgement. Some occasional heartfelt advice. Words of wisdom gleaned from greater writers and thinkers than myself. To-do lists and notes from meetings and conference calls. Intricate doodles from those same long calls. And then moments of poetry. Rereading my journals sustains me through challenging moments – I can step away and recognize my emotions and processes as waves that pass over me, clouds moving across the sky. When I am absorbed in feeling I am often surprised at how differently I felt a week ago, a month ago, a year ago. I start to see the patterns and cycles, and know that this too shall pass. If I could save one thing in my house from a fire – apart from the people – it would be my stack of notebooks. Even the thought of that loss clenches a knot in my stomach. A public forum is not a natural fit for me. A deep conversation with a friend or two or three is. But I’m learning that the trick to being a highly relational, sociable introvert – which I am – is to make every relationship as personal, particular, and intimate as possible, and then gather all of those beloved people together often. I want to keep stretching myself to share writing with people who are not yet in that safe space with me. Because as I keep telling my kids, as I encourage them into new situations, every dear friend, everyone I now love, was once someone I didn’t know. And I had to take a risk to welcome them into my life. And so I will choose to continue to take those risks both privately and publicly. Because the potential rewards are huge. But to write anything to public consumption requires me to give myself a big push, every time. And so perhaps it is time for some quicker sketches. Conversations starters. Experiments. I am inspired by Rozanne’s and Brooke’s 100 Scribbles. I am not committing myself to a daily post right now (perhaps never!) – I’m away from internet contact intermittently at various times of year, and I like it that way. But I will up the volume, and focus on economy of words. Loosen up. Reduce the stakes. Let go of the curse of professionalism. Just create and share something. And so I believe this is the perfect time to experiment with poetry, which I have been doing the past couple of months. Because why write an essay when it’s so often one simple image that I am trying to carve out. I will start with this one. Under the loving rhythms of my feet.